The madness continues …. 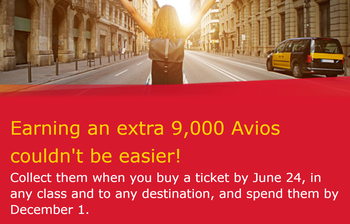 the Iberia ‘90,000 Avios for £200’ deal ends tonight. Let’s do the maths. In all of the years I’ve been running Head for Points, I don’t think I’ve ever seen a deal get as much attention – globally – as the Iberia ‘90,000 Avios for booking 10 flights you don’t need to fly’ offer this weekend. We’ve certainly had good Tesco Direct deals in the past which were more generous, such as 2,400 Avios (1,000 Clubcard points) for a £10 printer ink which you could resell on eBay. These were glitches and got no attention outside the UK. This deal is NOT a mistake – Iberia has been keen to tell us that! – and it is getting huge amounts of traction across the world. You can book the Iberia deal here if you still want to jump in or find out more. So …. if you can find 10 cheap one-way flights on iberia.com for €25 each (Santander to or from Madrid still had availability at that price last night, obviously prices are lowest in Winter) then you are getting 90,000 Avios cheaply. There are restrictions on using these Avios and I STRONGLY recommend reading my article from yesterday here before booking. I am guessing that between 50,000 and 100,000 seats will be booked under this promotion. If you think that sounds high, remember that it only requires 5,000 to 10,000 people to book their full quota to hit that number. You also need to remember that non-UK frequent flyer sites have been going crazy over this deal too – virtually all of them, I have to say, giving less focus to the potential downside risks than we have. What would 100,000 booked seats mean? Iberia Group carries 85,000 passengers per day, so this equates to over one full day of passenger numbers! It is all very odd and, frankly, probably beyond anything that Iberia thought would happen. There will be some interesting discussions in Madrid on Monday. Iberia cannot realistically go back on the deal, however, given that it briefed various websites including Head for Points on Friday about how the offer worked. And now the feeding frenzy stops. This is going to be fun to watch. oh, i think may just have begun. wait until the points drop. If you have a new account, don’t forget to check manage my booking to see if your Iberia number is there. Mine wasn’t! Now it is. And it’s gone, at 23:00. Well, i only managed to get six out of my possible 10 as I left it too late and the website crashed quite a few times in the last hour (10-11pm). Serves me right for procrastinating over the “if its too good to be true, I might not be true…” saying, but decided to bite the bullet anyway. Hopefully it will all work out for everyone. Thanks Rob for all your hard work on this offer. I’ve managed to get 8 tickets. But couldn’t finish the last two by 11pm due the slow response of website. Anybody know if it is seriously ended by 11pm or it meant 24 June local time? I can see the page has gone from the main Iberia homepage but it is still accessible via Rob’s link. I feel that the main Iberia homepage is more a sign that the offer is over. The link may still work, but it won’t allow the points to post. They should consider Spanish Canary which has same time zone as UK. I am hoping my tickets which went over UK 11pm to buy while the payment was processing,. Ouch, finally made a first and only booking after much doubt about the veracity of this. Website was incredibly slow… booking confirmation email is stamped 23:00 exactly. Now that we have passed 11pm, is it possible to find out a) whether Iberia are counting 11pm or midnight UK time as the cut-off; b) if bookings which have a pending card status, made before the cut-off, will still count? As I understand it, there is a 24-hour fee-free refund policy on bookings, so there is still time to take corrective action concerning resulting from any clarification on Monday. I just wish that people stop calling the airline and then broadly translate on here that an agent ABSOLUTELY POSITIVELY MOST SURELY affirmed so and so. Who do they expect to find on Sunday (or on the front-line CS number at all), an experienced IT engineer who understands in-depth on how Iberia Plus Avios platform works? I work as an Infrastructure Engineer for a very large accomodation booking site, the front line CS have absolutely no idea how the back end works. The marketing team are more likely to know, and I’ve read the email from them, forwarded from Rob. Still up om main Iberia site. Many years ago LH used to offer an overdraft for their Senator level frequent flyers. From memory it was more or less enough miles for a business class flight from Europe to anywhere in the world (including the South Pacific). I seem to recall that the number of miles was a relic from a very old coupon based system. At any rate there was no requirement to ‘pay it back’ when you dropped to FTL or back to Blue. Presumably the leakage on this was tolerable because this system stood for quite a number of years. Very foolishly when LH did a status match for BA status holders (just as the travel blogs/websites really stated to become serious ventures) they let all the newly minted BA Senators have the overdraft. All of a sudden they had a stack of people who had never credited a mile to LH redeeming long haul business class awards. LH’s solution for all this was to amend the Ts&Cs of Miles and More to provide that if you dropped down from Senator the miles had to be repaid (i.e. by being earnt) within 90 days (or similar) or LH could bill you for the miles (at some super high euro cents per mile). This applied across the board – namely to people who had both dropped down from Senator after earning it and who dropped down after being status matched. I seem to recall that LH did indeed start send invoices out. Whether they bothered to enforce the (GBP8k or so) invoices in a court in the member’s relevant jurisdiction is another matter. Although I would imagine that in this country there would be plenty of mercantile agencies who would be willing to do this charging LH only a percentage of recovery though. I would imagine that this will be one way for IB to attack the problem of thousands of IB+ accounts sitting at -90000 miles on 2 December. All of the bookings are linked to an account, simply they can work out which flight or route are most likely with lots of no show base on the analysis of someone booking behavior. I managed to book 5 flights 🙂 so that’s 45000 Avios points 🙂 l never book on Iberia before and used Iberia web site. So will it be bad if let go negative in December? As I always used BA to fly. Or should now book on Iberia in future? By the I also brought 4000 Avios on Groupon Ireland for €50 so in total 49000 Avios. Hopefully with my new Amex gold credit card I get another 20000 Avios when I spent £2000!! Did you not get referred so you could earn 22,000? No it was done directly with American Express. I should got a referral ???? FWIW, this is the message I got back this morning from the Twitter team. It seams that apart from what Rob was told by the marketing team, all the IB reps are singing with one voice. Presumably the proof of the pudding will soon be in the eating. If, that is, the points actually post in the near future …. I’m sure that will be the case. The question is whether they ring fence the promotional avios or simply disable all transfers. Depends how good their IT team is I guess! I made 10 separate one-way bookings for the wife and I, and I entered our Iberia Plus membership number on the booking. The confirmation email I got for each booking confirmed the Iberia Plus number had been captiured correctly. However I’ve just gone into the Manage My Booking on the Iberia website and under Passenger Information the Frequent Flyer Card info does NOT contain our Iberia Plus numbers. Instead it says “Add Number” and clicking this takes me to a page where I can enter my Iberia Plus number. This is a bit concerning to me. Any ideas ? When you’re logged in to the desktop site, click on ‘Bookings’ on the left hand side of the home page. All your bookings should be listed. If not, I’d suggest you have a problem. The link from bill does the trick perfectly once you’re logged into your account. Thank you. As I think Rob has already said, if your confirmation emails have the FF number in then I think you should be good, Worst case might require some chasing/manual application but their IT problems / inconsistencies should not be your problem. At least that’s what I’m relying on……..
I’ve just added on the number and now they all appear under “My Bookings” within my account and my wifes account. I did also send them an email earlier with screenshots so fingers crossed its ok and I don’t have to fight to get the points. I booked two flights and due to an IT error, the system claimed that the passenger name and IB Plus account names were different. They were not. There was no way to force the page to accept the number, so I had to go ahead and book without a FF number, choosing the write to Iberia same day via email and try to get them added. I would add, I have had my IB Plus account since 2014. I have just received a reply to inform me that as the number was not in the field at the point of booking, I am ineligible for the promotion. I consider this completely unfair and I booked these flights in good faith as a long standing member (certainly compared to people that were signing up their dog and great aunt with new accounts just to milk the promotion). I know a lot of people were having the same technical problem as I and some might even have gone ahead and booked 10 flights in the same circumstances…. Does anyone have advice about potential next steps? This feels like Iberia washing its hands of something that was down to their patchy IT in the first place. These twitter comments worry me. I dismissed the promotion when Rob first posted on it. However after reading the “Iberia Clarifications” on Saturday re transferring I went ahead and spent around 270 quid on the offer. I took part purely to transfer to BAEC and use for RFS to visit family. I do feel a fool if the Iberia twitter comments re transfers are correct. The Ts and Cs did not specify this was the case. Is it normal to be able to add to you Ts and Cs after a transaction? The Ts and Cs were fairly clear. The avios must be spent before 1 December and transferring out does not count as spending. Preventing transfers out only blocks a potential abuse of the promotion. Can’t really complain about that. To be fair, the RFS difference is usually not huge so you won’t be massively out of pocket if you end up booking those flights off iberia.com. I was too tired last night to make much effort so only managed 3 booking before 11pm, but that is enough for a CE out, ET back booking for a holiday next summer somewhere in the Balearics. Did a few dummy bookings and it was around £55 in taxes return from LHR, about a fiver less from LGW, compared to approx £35 if booked as 2 one way RFS so £20 difference is ok with me. Works out the total flight outlay would be £130 compared to cash price of over £400 so I’m happy with that. Sorry to be lazy as I know I could check this online – but can I book reward flights from IB portal LHR—>place in the sun (it’s just a regular BA European route from London), ie use my IB points for this? Just not get the reduced RFS £17.50 fee, is that it? Or can I only use the IB Avios on routes to/ from Spain? What is the date change fee on IB, anyone? @Harry I think it’s £60. has anybody looked up other ways to burn IB points other than flights/ hotels? Or think of it as a £500 hotel voucher than only cost you £200. Stop trying to milk it and play by the rules! Having read Rob’s clarifacation from Iberia, I thought I was playing by the rules! Flooding the Iberia avios market place with Avios for which there may be little availablity reminds me of a certain vacuum cleaner’s promotion from a number of years back.. Hoping to high-tail the avios out of IB+, and then deliberately leaving a -90k balace for which they can whistle, was never going to be playing by the rules. I got all the emails with the IB number on it. However, I paid with Amex and none of the transactions is showing up, not event as pending. Has anyone had the same problem? Is it because it was paid in euros? Possibly I had one not showing up on Amex card which was paid in euros. Wait a few days and it should appear on your statement. Yeah, some of mine were in EUR, some in GBP. The GBP ones are pending, the EUR ones nowhere to be seen, but I did get a push notification for each transaction on my iPhone. I can confirm this too. Transaction made in euros will take a couple of days to appear on your statement. Interestingly the bookings I made with my mastercard debit cards (from two different high street banks) still aren’t showing up (not even in pending transactions) yet the ones I made with my Visa credit (with a 3rd financial institution) hit the transactions list (not the pending transactions list) within a matter of an hour or two. All were euro transactions on UK cards.